SEOUL/WASHINGTON—The White House said any talks with North Korea must lead to an end to its nuclear program after senior officials from Pyongyang visiting South Korea said on Sunday their government was open to talks with the United States. The North Korean delegation, in Pyeongchang for the closing ceremony of the Winter Olympics, met at an undisclosed location with South Korean President Moon Jae-in, and expressed a willingness to meet with the United States, Moon’s office said in a statement. The Pyongyang delegation said developments in relations between the two Koreas and between North Korea and the United States should go hand in hand, according to the statement. The Olympics gave a boost to recent engagement between the two Koreas after more than a year of sharply rising tensions over the North’s missile program and its sixth and largest nuclear test in defiance of U.N. sanctions. The United States announced on Friday it was imposing its largest package of sanctions aimed at getting North Korea to give up its nuclear and missile programs. On Sunday, North Korean state media accused the United States of provoking confrontation on the Korean peninsula with the sanctions as it shows signs of strain under the concerted efforts of “maximum pressure” led by the U.S. The White House said its sanctions would continue. “There is a brighter path available for North Korea if it chooses denuclearization. “In the meantime, the United States and the world must continue to make clear that North Korea’s nuclear and missile programs are a dead end,” it said. 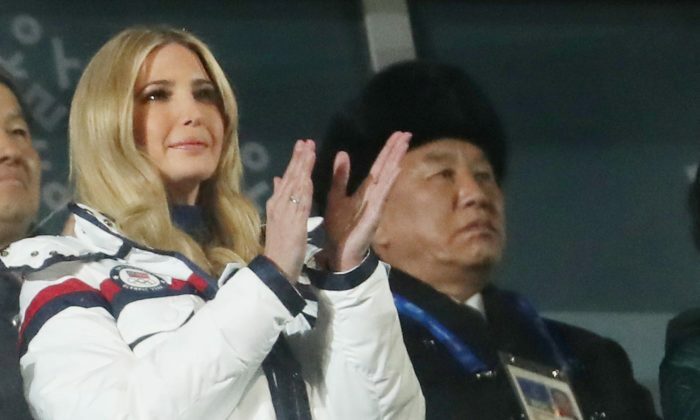 Moon, the North Korean delegation, and Ivanka Trump, U.S. President Donald Trump’s daughter, were among dignitaries who attended the Olympics closing ceremony on Sunday. Ivanka Trump, a senior White House adviser, did not interact with the North Korean delegation, a senior U.S. administration official said. She met Moon on Friday as part of a weekend trip leading the U.S. delegation to the closing ceremony. North Korea sent former military intelligence chief Kim Yong Chol, an official accused of being behind a deadly 2010 attack on a South Korean warship, to lead its delegation. 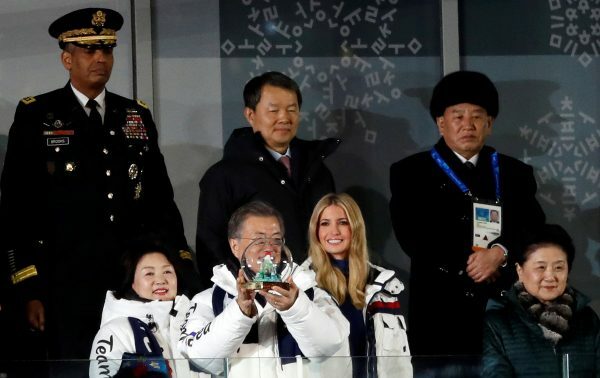 Moon met Kim in Pyeongchang, where the Olympics were held, before the closing ceremony, the South Korean government said. Earlier, about 100 conservative South Korean lawmakers and activists staged a sit-in near the border with North Korea, to protest Kim’s arrival and facing off against about 2,500 South Korean police. The North’s delegation took a different route, prompting the opposition Korea Liberty Party to accuse Moon’s administration of “abuse of power and an act of treason” by rerouting the motorcade to shield it from the protest. The North sent Kim Yo Jong, the younger sister of North Korean leader Kim Jong Un, to the opening ceremony. She was the center of a frenzy of attention, especially when she appeared at the opening ceremony and was only a few feet from U.S. Vice President Mike Pence. They did not speak. The U.S. president, in announcing the new sanctions on Friday, warned of a “phase two” that could be “very, very unfortunate for the world” if the sanctions did not work. China also reacted angrily, saying on Saturday the unilateral targeting of Chinese firms and people risked harming cooperation on North Korea.